A few years back I discovered the existence of German Transformers comics. The covers were strange... but even better, I found that they had original text stories! I promptly bought a load from ebay.de and had them translated for the good of all! 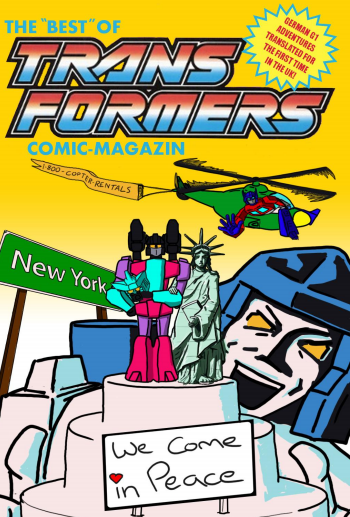 The 'Best' of Transformers Comic-Magazin was a fanzine distributed free at Auto Assembly 2011, now uploaded in PDF form for everyone to enjoy. Just click the link at the bottom of this page to view it. This fanzine is a collection of translated prose stories from the official German Transformers 'Comic-Magazin' published in the late 80s and early 90s. These form an exciting if bizarre 'forgotton' canon and are at the very least entertaining reading. Where do the Classic Pretenders really come from? What is Shockwave's Galactic Secret? Why does Goldbug want to desperately speak to Bumblebee? How did Optimus Prime build (and curse!) the pyramids? All these and more will be answered! Download the entire collection here!